"La Força d’una idea (The Strength of an Idea)", 1992. Iron, 16.5 x 13 x 13 ft.
Kimmelman was right about these themes in Arimany’s work, but though this Spanish sculptor was new to New York, she was hardly a novice in her field. By 1992 Arimany had already been exhibiting her work for 17 years. In addition to sculpture she has produced large ceramic murals for hospitals, churches, sports arenas, government buildings, and schools; created monumental commissions of iron, steel, and stone for public parks, plazas, and a railway station; won a number of art awards; and been a guest lecturer at two universities. But her name remains less familiar to most Americans than those of her fellow Spaniards Cristina Iglesias, Juan Muñoz, and Susana Solano because most of Arimany’s exhibitions have taken place in Spain, Germany, France, the Netherlands, Argentina, and Eastern Europe—and because most of the critical writing on her work is in Castilian Spanish or Catalan. Arimany was born in Sant Vincenç de Castellet, a small town about 30 miles from Barcelona. Her father, Salvador, was a builder and the founder of the Rosa Grès company, which manufactures ceramic tiles made of refractory clay (specially formulated to withstand high temperatures) for architectural and industrial purposes. Arimany’s early training—in construction techniques and the use of various materials—was with her father, whose business interests have become a family tradition. Although she was employed for a number of years by the Ceramic Research Laboratory of Rosa Grès, where she did research on ceramic formulas designed for both industrial and sculptural purposes, Arimany always had an interest in the traditional fine arts. As a teenager she took classes in drawing and painting at the nearby Escola Massana, where she later attended sculpture classes. She also studied sculpture at the Escola Industrial in Sabadell, another of Barcelona’s satellite towns. But it was in the mid-1980s, after years of creating Chinese-porcelain murals, that Arimany shifted her professional focus to become a full-time sculptor. Like many late-20th-century artists, Arimany tends to work in series, restating her visual themes in varied scales and in different materials. Arimany’s first experiments with using refractory clay as a purely sculptural medium resulted in a group of handsome yet surreal and curiously threatening works. These works were based on cube-like blocks of clay with unexpected openings through which half-hidden, spiky projections could be seen. "Camp Magnètic", 1984–85. Stoneware and paper, 5 x 14.5 x 5.5 in. By 1984, the artist had moved on to one of her most unusual series, which plays on the paradoxical relationship of two presumably incompatible materials: richly colored, opaque, and durable clay combined with delicate-seeming, translucent forms made of handmade paper. (Arimany is always careful to give credit for help in her explorations of the latter material to Tom Pupkiewicz, an American papermaker living in Barcelona.) In these works the artist revels in the varied textures of her materials and in the unexpected formal juxtapositions she creates. For example, a wedge of paper seems to magically bind together two segments of clay in Camp Magnètic (Magnetic Field, 1984–85). In Translúcid (1984–85), a void in the center of a clay rectangle is filled with vertically oriented paper "leaves," arranged like a mini-field of grain or a misplaced set of office files. Sometimes the paper is stacked or sandwiched in thin sheets between layers of clay; the effect of suffused light coming through the paper in these works is quite remarkable. Many of Arimany’s series explore the theme of "space-cages," rectilinear structures formed of iron bars that pierce and thus suspend rough masses of clay, blocks of stone, or other materials. Hope Chest (1995) features a suspended rectangle of resin with pieces of handmade paper embedded in it. In this and other works of the 1995 "Trapped in Amber" series, titles and materials add mystery to the sculpture. In many of her works, Arimany employs resin to add a broader range of colors (yellows, blues, and greens) to her palette. Her affinity for clay is a virtual birthright but so, too, is Arimany’s love of both iron and stone. Many writers have noted her place in the great tradition of Catalan iron-workers, exemplified by Julio González (1876–1942). The artist herself commented, in a recent interview, that her interest in carving began in infancy: "My town was surrounded by mountains of stone, which seemed to me like huge sculptures jutting out of the Montserrat range." (All translations are by the author.) Arimany has used all three materials to make dynamic, abstract forms that imply movement. Irrupció interior (Internal Explosion, 1991) is a boxlike structure framed in iron with open, wire mesh sides and a small pile of irregular stones at the bottom. What makes it more than an interesting variation on the standard container form is the fact that it appears to be breaking apart at one edge. 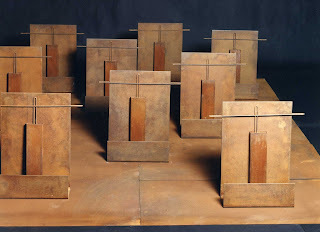 Likewise, the piece called Coming Out (1992), made entirely of iron plate, initially seems to be a straightforward arrangement of rectangles, piled atop one another. But the metal layers are slightly askew, and the central square is canted, revealing a mysterious space below and an emerging, unidentified shape. Arimany’s piece for Socrates Sculpture Park is also made entirely of iron, but on an enormous scale. It, too, seems to be in motion, made of huge, vertical metal slabs, many of which look as though they have cracked in two and are toppling over onto the ground. Diagonals—formed by ladder-like compositions, or slices of stone leaning against metal structures—are central to Arimany’s work. 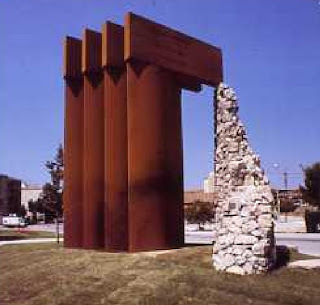 Even a piece like El Quart Segell (The Fourth Seal, 1990), made primarily of Cor-Ten steel, gains character from the way in which each of the elegant, open metal boxes is separated from the rest, and tilted by a narrow cylinder of roughly-carved stone. Also, one of the bottom corners has been lifted onto another, identical stone, which makes the entire sculpture seem precariously balanced. "Strategy and Tension", 1994. 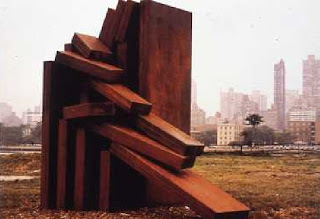 Cor-Ten steel, 8.5 x 7.75 x 2 ft.
Aside from the inevitable debt to González, there are a number of other obvious comparisons between Arimany’s art and that of her compatriots. The Grand Old Man of Spanish Modernism, Eduardo Chillida, has also worked in many different materials and techniques and, like Arimany, he, too, has explored both solid and open forms. While Arimany readily acknowledges the significance of Chillida’s contribution to 20th-century sculpture, she does not see a relationship between her work and his. On the other hand, she seems to share with both Solano and Iglesias an interest in using industrial materials for her art and a tendency to imply, but seldom explain, a narrative subtext. The sculpture of Solano seems especially close to Arimany’s in several ways: it also relies primarily on iron; it shares some intriguing formal similarities—such as the construction of open, wire mesh or glass-faced metal boxes with crumpled bits of lead (versus Arimany’s stones) at the bottom; and both women are Barcelona natives. But, whereas much of Iglesias’s work is clearly based on the architectural fragment, and Solano frequently evokes domestic interiors, Arimany’s sculpture is generally nonreferential. Critics have noted the relationship of Arimany’s work to that of several American sculptors—notably Carl Andre and Donald Judd. Certainly, she shares their interest in rhythmically repeating a small number of simple, geometric shapes. But Arimany’s art is hardly Minimalist. Rather, it is organic —emphasizing asymmetrical, irregular, clearly handmade elements. Sometimes it is even lyrical, especially when made with paper, resin, or wax. The artist for whom Arimany expresses the greatest admiration is Richard Serra—because, she says, his work "gives viewers the opportunity to interpret it in their own way." These two sculptors also seem to share a reverence for the physical and aesthetic properties of their materials. Yet much of Serra’s art is somewhat austere, while Arimany’s often seems whimsical. For example, Games, the monumental steel sculpture she created for the 1996 Atlanta Olympics, features five large metal boxes, half tumbling off a tall, open metal circle, in an apparent homage to the Cubi of David Smith. Although her work is clearly abstract, it frequently does carry symbolic content. While she describes herself as apolitical, others have long perceived political elements in her work. For example, in their essays collected in the catalogue for Arimany’s 1990 exhibition (sponsored by the Fundació Caixa Barcelona), Francesc Miralles, Pilar Parcerisas, and Olga Spiegel all refer to the way in which the different materials used by Arimany "struggle and fight" with each other. Both Miralles and Spiegel say that, in her sculpture, paper is "imprisoned by clay," and Spiegel goes on to interpret this struggle as a metaphor for the power "of tyrants over the weak, of oppression versus freedom." Some observers see these struggles within Arimany’s work as symbolic of ideological conflicts of all kinds—within a family, a nation, or society in general. There is evidence to support the contention that at least some of Arimany’s sculpture deals, on one level or another, with issues of repression. Her titles are mostly in Catalan (though some works especially those made in her Miami studio, are titled in English). Arimany’s formative years were lived under Franco, whose repressive policies included severe restrictions on any public manifestations of traditional regional culture, including the open use of the Catalan language. Thus her use of the language has a powerful resonance. Perhaps the most "political" sculpture by Arimany is Fahrenheit 451 (1993), based on the 1967 film by François Truffaut (adapted, in turn, from Ray Bradbury’s novel, published 14 years earlier). In both the novel and the movie, reading has been banned by the government, in a campaign of thought control, and "firemen" are trained to find and burn any remaining books. 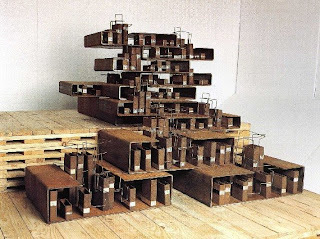 Arimany’s sculpture represents a library filled with volumes—actually, a series of rectangular iron modules that are both bookcases and the books themselves. She has also included mock antennas made of bent wire, because, in this society, reading has been replaced by watching what we now call big-screen televisions (Truffaut’s emphasis—in the opening credits of the film—on the proliferation of TV antennas on the rooftops is his most powerful image). One of Arimany’s forthcoming projects also has an obvious political aspect: she is working on a sculpture made of iron and stone as a tribute to Carrasco Formiguera, a noted Catalan politician who founded UNIO, the political party currently in power in Cataluña, and who was killed during the Spanish Civil War. All of Arimany’s work, regardless of any political subtext, is about sensuality, mystery, and motion. Abstract, but never mechanical, her sculpture has an inherent sense of humanity, which makes it accessible to a broad range of viewers and allows it to make a powerful statement, on both a monumental and an intimate scale. Nancy G. Heller teaches at the University of the Arts in Philadelphia. "Roads", 1992. Cor-Ten steel and stone, 16.5 x 11.5 x 13 ft.
Publicado por Elisa Arimany en 9:26 p. m.